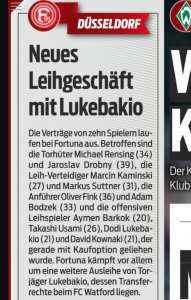 Dodi Lukebakio is having an interesting season on loan at Fortuna Dusseldorf. He’s shown flashes of absolute brilliance, but has also proved an annoyance and shown, according to many voices in Germany, that he’s got an awful lot of growing up to do, both on and off the pitch. On November 24th, the 21 year old scored a hat-trick to secure a 3-3 draw for Fortuna against Bayern Munich. It led to hype everywhere, the player was even linked with a move to the Bavarian club. A few days after that performance, German newspaper Bild said it would help him win over teammates who had been unsure due to his ‘extremely strong self esteem’ and issues with timekeeping. In December, manager Friedhelm Funkel was unhappy with his attacker’s behaviour and slammed the Belgian for his antics during a match against Werder Bermen. This week’s edition of SportBild explains, despite all the issues, Fortuna will ‘fight’ hard to secure the Watford player for next season. They currently have a little breathing space from the relegation zone, so that should go in their favour, but SportBild don’t sound overly confident. Any new deal with Watford would be on the basis of another loan, and given he has a contract lasting until 2022 it wouldn’t put too much pressure on the Hornets. There may still be hope for Fortuna. Watford will know everything that’s happening in Germany, the good and bad, and may feel their player isn’t yet ready to be a part of Javi Gracia’s senior squad.